ePuffer® is a Global company and a respected leader in the design, manufacturing and sale of quality electronic cigarettes and innovative vaping supplies in Canada and across the globe. They offer a wide range of electronic cigarettes and related smoking devices to millions of smokers in 26 countries around the world. ePuffer designs, manufactures and sells electronic cigarettes, electronic cigars, electronic pipes, e-liquids, e-hookahs, mods, pods, cartridges & various accessories. Through the array of products that they have brought to the Canadian market, ePuffer has become an integral part of how people begin their journey towards a smoke free lifestyle. ePuffer began as a small initiative back in 2007 with the sole intention of providing smokers with a healthier alternative to tobacco products, it turns out that there was such incredible demand for their products that ePuffer quickly grew to become one of the worlds largest and most innovative vape suppliers. It wasn’t until recently that ePuffer entered into the Canadian market place as Health Canada’s nicotine restrictions have since been removed allowing for www.ePuffer.ca to expand its reach to the Canadian consumer. ePuffer continues to be a major player in the vaping industry and has designed several award-winning products that are being met with great appreciation from the buying public. The company has grown exponentially in the last eleven years and has quickly become a force to reckon with as they continue to dominate the vaping market. ePuffer is always at the forefront of creativity and innovation, advancing with the ever-changing industry has proven to be the catalyst to much of their success as new products need to be created to meet new demands and epuffer is a master of design. I'm stoked to announce that ePuffer's world-class line of electronic cigarettes, e-cigars, e-pipes, e-liquids and vape supplies are now available in Canada. They've recently launched their official Canadian website with the introduction of several new products to compliment their already impressive line up... Check em' out! Over a half a million people have enjoyed ePuffers electronic vaping products and most of them continue to do so to this day while doing away with the harmful effects associated with traditional tobacco products. With their patented True Nicotine™ formula, ePuffer has been able to closely simulate the look, taste and feel of real tobacco products thereby satisfying the cravings of even the most discriminating smokers. They take your feedback very seriously and implement your ideas and suggestions when designing and creating new products to bring to market. ePuffer Canada is also a proud sponsor of the Canadian Red Cross, extending charitable donations in support of their hard work. What more can be said, these guys sell top notch vaping products at very reasonable prices (even better when you apply an ePuffer coupon code) and I wholeheartedly recommend them! Copyright © 2007-2019 ePuffer® Canada. All Rights Reserved. SAVE Up To 80% on Discontinued and Overstock Merchandise at ePuffer Canada! 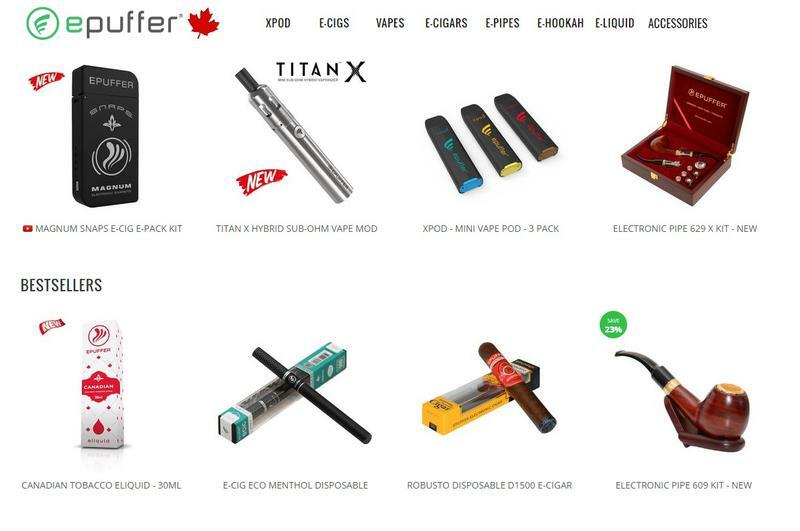 At ePuffer Canada products periodically get discontinued and overstock situations sometime occur, what happens in those instances is that EPUFFER will sell-off those products in their "Clearance Section" at drastically reduced prices giving you the opportunity to purchase some of their world-class vape products at insanely low prices. Everything in their Clearance Section is reduced by at least 50% and in some cases prices are slashed by as much as 80% ... There's some smoking good deals!